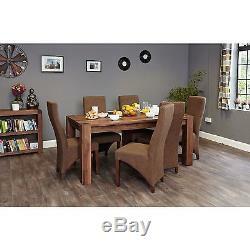 Malvern solid dark wood furniture set of six upholstered brown dining chairs. 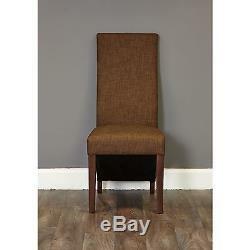 A set of six chic upholstered dining chairs in Hazelnut shade. Constructed using a solid hardwood frame and walnut legs. Upholstered in a luxurious, hardwearing linen fabric that conforms to British Safety Standards UKFR BS5852. The dimensions are H105 x W41 x D55cm. The seat height is 48cm. This is a solidly constructed piece of furniture and no assembly is required. Exceptional build quality - designed to last a lifetime. Chairs are supplied in sets of two. 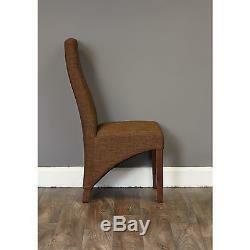 Also available with oak legs. If you do live in any of these areas, an additional surcharge may apply. Surcharges can be removed at the discretion of management. Failure to do this may result in a delay in your item being delivered. The drivers operate modern liveried vehicles. They are fully trained and knowledgeable about the product they are delivering. You can also collect your item free of charge. Assistance may be required for large and heavy items. An additional charge may be applicable. Finally, there is also a White Glove service avaiable. There would be an additional charge for this service. An assembly service is also available at an additional charge. The item must be in its original condition and packaging. It must be unused and complete. In the unlikely situation where the item is damaged, please adhere to the following procedures. Advise us within 3 days of receiving the item that it is damaged. Both service are offered at no additional cost to the customer. However, this decision lies entirely with our management team Please ensure that the original packaging is kept for the item. Not only do we offer a fantastic pricing structure but if you do find the same furniture elsewhere at a lower price then we guarantee to beat or match the price subject to the following conditions. The item is brand new. The item is currently available. The name or product code of the item. The website address and if possible the exact webpage URL. The price you have been offered on the alternative website. Please note that the ultimate decision to offer the price match lies with our management team. If the price results in Container Furniture Outlet making a loss then we have the right not to uphold the price promise. Container Furniture Outlet is a family run business based in Preston operated by a management team that has a wealth of experience in retailing furniture. As well as this, our office consists of a dedicated team of customer service representatives who will help you with any queries. 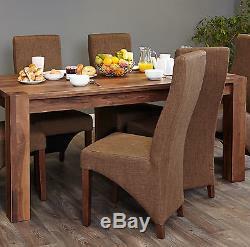 Our message to all our customers is simple: we will deliver to you quality furniture at an unbeatable price. We will also back this up with outstanding service through our dedicated customer service team. At Container Furniture Outlet, you will have the peace of mind to know that we will give you our 100% attention from start to finish. We are open Monday to Sunday including all bank holidays. The item "Malvern solid dark wood furniture set of six upholstered brown dining chairs" is in sale since Thursday, March 16, 2017. This item is in the category "Home, Furniture & DIY\Furniture\Chairs". The seller is "furniture-outlet" and is located in Preston. This item can be shipped to United Kingdom.